Let’s talk about European soccer and the fan experience. I am blessed to have a sister who lives in Europe. My husband and I travelled to Verona, Italy for our honeymoon in 1997 to hang out with her and her husband. As part of the trip, we did a little driving tour around the area and ended up in Parma on game day. Neither my sister nor her husband had ever been to a soccer game so, on a lark, we talked them into going. 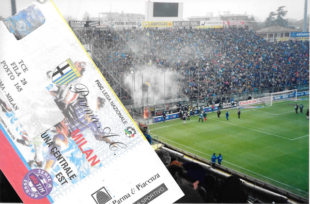 It was Parma vs AC Milan. We were AC Milan fans only because our favorite MetroStars player, Roberto Donadoni, was a former player. Imagine four Americans wandering in to an Italian soccer match — late. We desperately tried to find our seats, though later we realized there weren’t actually assigned seats, you just plopped down wherever your mates were. The old Italian guys started screaming at us to sit down because we were blocking their view. My sister and her husband speak fluent Italian so we did, cramming four of us into a space for two. As the game went on, there was lots of yelling, some of it phrases that my sister had never heard before, including something involving pigs and cows. Not really sure what it meant, but you get the jist. Since my husband and I at the time were season ticket holders for the MetroStars, we thought we had an idea of what the crowd would be like at the match. I’m looking around the stadium. I notice in the stands near one of the goals there seems to be a section that is fenced off with fans inside. Hmm. I then see there are a group of them all huddled around something off to the edge of the enclosure. And then all hell breaks loose because they have set fire to all the programs that they have collected. Flames and smoke are billowing everywhere as all of the fans in that section run as far away as possible and end up crammed in the farthest corner of the section. We wait and watch. No water, no fire extinguisher, no police — nothing. The game goes on and eventually the fire burns out and everybody goes back to their seats. I have no memory of who won on that day, but I do remember on the way out seeing a line of policemen had formed a tunnel so AC Milan fans could leave the stadium without being attacked by the home support. I share this because I am on my way back to Germany for Thanksgiving to visit my sister and I realized I might be able to catch a Bundesliga game while I’m there. She lives in Monchengladbach so I had a few choices. Being that I’m a huge Christian Pulisic fan, I couldn’t pass up the opportunity to see him in person. I naively thought I could go online to the club website and buy tickets. $60 in scalper fees later…well, at least I have tickets to see Dortmund vs. Eintracht Frankfurt. I’m a little nervous about buying the tickets from a third party, but they looked reputable and I’m keeping my fingers crossed. Hoping my sister had connections, I also wanted to see Borussia Monchengladbach vs. Man City in the Champions League, but it was going to be $200 for a single ticket and I so had to pass on that. I am assuming that the Germans will be a little more mellow than the Italians, but I’d love to hear any stories that you have from your travels. A police tunnel to get out of the stadium. Woof. My wife’s best friend from high school lives in Germany and has told us about “mandatory” world cup viewing parties she threw on behalf of her German then husband. I would expect not-an-American level of intensity, given her descriptions. I was five or six rows back in the corner the cross came from on this second goal. I can picture Amrabat flying down the touchline, avoiding the tackle, composing himself, finding the pass. A pure demonstration of counterattacking footy. He got thrown out later in the match. A fine night indeed for the Anchovies. I was in Rome for six weeks in 2012 and remember some Tottenham fans getting stabbed. Italians have their sects of baddies, for sure, but my experience was limited to explaining my Milan jersey. I was in Lyon, Marseille, and Nice last spring and of the bunch, Marseille had the most visible (and somewhat intimidating) fandom. I’m thankful my time in Marseille didn’t fall during the Euros this year. I’m still waiting to go to game in the UK. I think I’d rather see a Championship match with actual supporters than a PL match with wealthy socialites. (I’d take any ticket, let’s be honest) The Bundesliga is super appealing as well. Going to a Dortmund match sounds divine but visiting Berlin and seeing Hertha would be neat. I love this sport and want to see it everywhere with everyone. My brother and I are going to be attending our first soccer matches abroad in a few weeks starting with Birmingham City @ Burton Albion, then WBA @ Liverpool and ending with Granada @ Barcelona. Was hoping to catch Dynamo Zagreb @ Sevilla but we’ll be hiking in the Sierra Nevadas at that point. That being said, I don’t think we’ll experience any real hostile atmosphere at these league games. All we have to compare the atmosphere to is the River End, some away games to DC and NYRB, and the 65,000+ attendance match for USA/Turkey in Philly back in 2010. Was once at a Celtic – Aberdeen Cup final. Was part of the Aberdeen fans. After the match we had to wait inside the stadium until the stadium and the whole area around the stadium had cleared. Only then did the let us out. Once out we were led away surrounded by policemen on horses. Nothing serious happened but these precautions were taken based on fights that happened in the past. Was at many Celtic Champions League matches which were very ‘peaceful’. Was also at the Germany vs. Italy semifinal of the 2006 WC in the Dortmund stadium. The most incredible thing there was that a guy who ended up sitting next to me came also from Philly and we both had gone to the same HS! In the late ’90s I went to an Aston Villa vs Arsenal match. We were in the visiting fans section and there were no seats. You just stood. The crowd was spirited, but there was no hostility that I noticed. Well, the fan experience varies heavily from country to country. There are certainly countries in Europe with a substantial violence problem. The “gold standard” in this regard seems to be Serbia, where the Belgrade derby between Red Star and Partizan is well known for being some kind of civil war (you might want to check it out on youtube…). Italy is definitely a country with a long history of football-related violence. Back in the 90ies, that didn’t hurt too much, since the Serie A happened to be the best league of the world far and away. These days, with a plummeting quality of gameplay over the last decade, are less glorious and the attendance numbers reflect that. Fewer and fewer people are willing to pay a lot of money to see second-category football in an unhealthy atmosphere dominated by thuggish supporter groups. Viceland did a great piece on Vice World of Sports about the Belgrade Derby…scary! SLB Benfica vs. I cant remember who. Being part of the Benfica fans, I was passionate. Down 1-0 going into the 90th, we score 2 goals and the crowd goes crazy. Peaceful for what I could see, was in Portugal and probably one of the better soccer environments I’ve bee to. Very passionate fans.